I didn’t really even WANT to make a post about this. The alpha-beta-omega model of wolf packs is dead in scientific literature, hammered into the ground, so to speak, and it’s been dead for over ten years. So why am I still hearing about it on TV and reading about it in articles? Why are popular dog trainers that encourage you to “be the alpha” still taken seriously? I think the unfortunate truth is that the idea that there are strong and ferocious leaders in wolf packs and that you, too, can take on that role with your dog is just somehow appealing to people. Almost romantic, in the older sense of the word. And because of this, it makes money. It sells werewolf media. It sells dog training classes. Educational science channels that have no business promoting this false ideology keep it on board because it gets people watching. If you couldn’t tell, I’m pretty fed up with the whole thing. Okay, let’s talk about dominance, particularly what the word even means, because popular media does a terrible job of explaining it. Before we even talk about canids specifically, let’s clear something up. What does it mean when an animal is ‘dominant’? Well, to start with, the above isn’t even a complete sentence. You can’t really say ‘an animal is dominant’ in the same way that you can’t say ‘an animal is chasing.’ Who is that animal chasing, and who is that animal dominant in relation to? While there are many hazy definitions of the word dominance in the current scientific literature, the most accepted one that I have seen is that dominance is a factor of a relationship between two individuals regarding control of resources. In this relationship, the submissive individual will allow the dominant individual to have the resource. Theoretically. What dominance is NOT is a character trait. No animal is born “the alpha.” Studies of wolves in captivity and in the wild have shown that the fact that an individual is the highest-ranking member of one pack has little to no bearing on the animal’s rank if it moves to a new pack. Similarly, studies of parent-raised canids have found that no stable hierarchy forms in litters of pups. And finally, dominance relationships are often based off of the result of a single fight; if two individuals are evenly matched it can be a more or less random conclusion. Where defining dominance gets complicated is when you try to apply it consistently to a group of animals. Which behaviors are going to tell you about dominance relationships, and how will you analyze them scientifically? Some scientists like to use overt aggression only because it is clear-cut and obvious; whereas others say that a stable hierarchy will show little to no overt aggression and rely on subtler signals; whereas others analyze both displays of aggression and displays of appeasement. And once you’ve picked your signals and gathered your data, the confusion is far from over. There are many disagreements about how to analyze the data. Most scientists agree that the most important interactions are found in dyads (pairs) of animals, but then most scientists are much more interested in finding out rankings within an entire social group. Dyads can be pretty easy to analyze, but groups, not so much. That would form a hierarchy with A at the top, B in the middle, and C at the bottom. Form of the traditional linear hierarchy. The arrow points from the dominant individual to the subordinate individual. Even though A has the most wins, it always seems to lose against C. Likewise, B always seems to win against C. Who’s on top in this hierarchy? Furthermore, what if there’s a fourth individual, D, that never fights anyone? Where does it fit in? The dotted line represents a relationship that had no clear dominant individual. Figure redrawn from Bradshaw, Blackwell, and Casey, 2009. 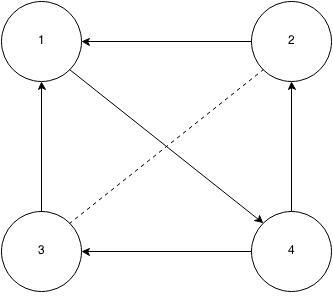 Dashed lines between pairs indicate no clear dominant individual despite multiple interactions. No line between a pair indicates that the pair rarely interacted. There is a final factor I haven’t even mentioned: dominance relationships may change over time. And in fact, it’s known that they do, usually based on external factors such as the death or injury of a group member, availability of resources, certain individuals reaching sexual maturity, season, etc., etc., etc. Sometimes the hierarchy changes for no apparent reason at all. Different species appear to have different forms of hierarchies, but it also really depends on who you’re asking about it and how they analyzed it and what theory was popular when they did. The study of dominance can be unfortunately subjective. Still, the literature is what we’ve got, so let’s use it. The term ‘alpha’ was first coined by Rudolph Schenkel, a Swiss fellow, in 1947. Schenkel was studying a pack of unrelated captive wolves at a zoo in Switzerland and observed that they were frequently aggressive with one another over resources. He described a fiercely competitive hierarchy among the animals, where the victor got the spoils: food and breeding rights. But even at the time- even in 1947- Schenkel did admit that the wolves were in captivity, not in the wild, where things might be different. He mentions that other authors had theories about wild wolves having something like a nuclear family structure in their packs. L. David Mech took Schenkel’s alpha concept but not his footnote and popularized it in his 1970 book called Wolves: Behavior, Ecology, and Conservation. The idea took off and hit mainstream culture, and there it stayed, despite the fact that Mech is ironically now one of the people most adamantly against this view of wolf packs. His mind was changed after he participated in a 13-year study of wild wolves in Alaska. During this time, Mech observed little aggression and no status challenges. The naturally-forming wolf packs were composed of a core unit: a breeding pair. The other adults in the pack were not unrelated individuals, but their adult offspring prior to their own dispersal. The makeup of a typical wolf pack in the wild. The fundamental problem with studies of dominance in captive animals is that the groups they live in are artificially constructed by humans. The animals do not have a choice about who comes into the group and who leaves. This leads to increased aggression for two major reasons: one, the individuals entering the group may not be family members or individuals the others have grown up familiar with, and two, individuals cannot disperse from the group to seek new territory. Among all the social species, the majority of groups are formed of family members and not unrelated individuals. This is true for all canids. In these families, dominance loses most of its meaning as a construct because the ‘dominant’ behaviors are often based largely on how individuals are related to one another. Offspring act submissive towards their parents both as puppies and adults; when they do begin to get aggressive, it is a signal that they are ready to disperse. Parents almost never initiate aggression towards their offspring. So while it isn’t wrong to call the parent wolves the ‘dominant’ or ‘alpha’ pair, it’s an extra label that gives information already implied by the fact that they are parents. 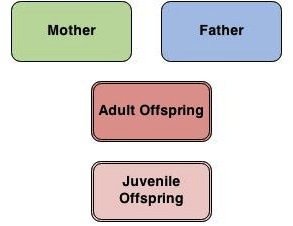 It would make no sense for offspring to challenge their parents for the dominant role in a pack: winning that role would mean that they would be winning to right to mate with one of their parents. A few different studies on canid species have confirmed that wild canids are aversive to breeding with individuals that they are highly familiar with. Dispersal is the canid mechanism to avoid inbreeding. This makes sense even on the most basic level, yet that damnable pop-sci alpha concept still exists today. Folks, it was debunked in 1999. So, in a nuclear wolf family, dominance is an extraneous construct. However, not all wolf families are nuclear. Certainly not captive ones, as we discussed; whether or not the behavior is caused by human intervention, dominance hierarchies do exist in captive wolf packs to varying degrees. It is arguable about how linear they really are, but they do exist. Wild wolf packs are not always nuclear either. The simplest form of this is when one parent dies. As I mentioned before, none of the offspring are going to be especially eager to mate with mom or dad, so an unrelated wolf may take the role- a ‘step-parent.’ In this case, because they are not as familiar with this new father or mother, the same-sexed offspring may act aggressively towards them and provoke more conflict. This also provides the opportunity for the opposite-sexed offspring to take the breeding role and mate with this unfamiliar stranger. 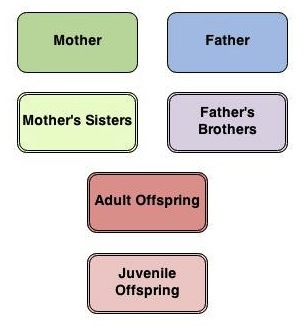 The minor changes in the behavior of these step-families can become very different in what is know as disrupted families. Rare in the wild except, again, in cases of human intervention, disrupted families are often large and contain lines of siblings without their parents. 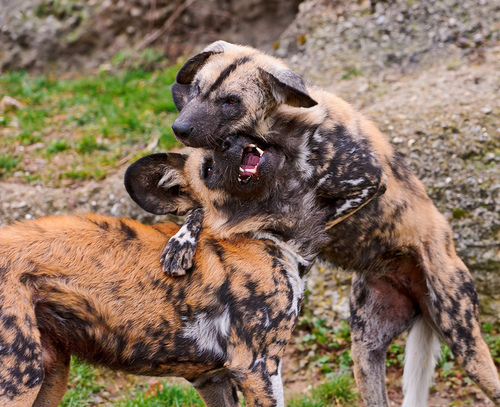 Pups raised without their parents in captivity are often more aggressive with one another; likewise, among the adult siblings in disrupted families, distinct same-sexed hierarchies may form. In these disrupted families there may be more than one breeding pair at a time, leading to very large packs. Matriline- and patriline-style packs are unusual in wolves, but common in other social canid species such as dholes and African wild dogs. These species show very little intragroup aggression, interestingly enough, likely because they depend on larger group sizes in order to successfully hunt, raise pups, and defend against larger predators (the gray wolf rarely faces a threat of the likes of hyenas, lions, or tigers). The typical pack structure of African wild dogs and dholes. Groups of same-sexed siblings disperse from their natal packs and form new packs with opposite-sexed groups, so that there are unrelated sets of male and female siblings. Generally, only one male and one female breed. There is not much consensus in the literature about how African wild dogs and dholes decide who in each set of siblings is going to breed. Most sibling groups seem to have it worked out before dispersal, because there is little to no fighting over it when the time comes; but there is also little to no fighting over it before the groups leave, either. As a whole these species are more amicable than gray wolves and have very highly ritualized submissive displays, so the decision may be made in a subtle way that researchers haven’t picked up on yet. There have been very few studies on the matter. Authors are also a bit split on how matrilines and patrilines are structured in terms of dominance. Some authors have said that there are no discernible rankings among nonbreeding adults, others argue that their is a linear hierarchy within each gender but not between. Time- and more research- will tell. I want to close this little essay on a concept we haven’t paid much attention to yet: submission. Submission is often portrayed as the opposite of dominance, but that isn’t exactly true. If you were to calculate rankings in a social group of animals both by their displays of dominance and by their displays of submission, you might come up with two separate hierarchies. The fact of the matter is that displays that we term submissive or dominant can appear under a myriad of different circumstances. As I stated before, not all aggression in a group relates to dominance. Similarly, not all submission within a group relates to it, either. Submissive behaviors in canids include things like lip licking, low tail wagging, whining, and rolling over. All these behaviors can function as a way to appease an aggressive family member. However, they also function as forms of play solicitation, as a means of bonding, and as a means of getting food. Arguably, submissive behavior can function as a means of being dominant over somebody else: food-begging, while seen as submissive, allows one individual to co-opt a resource from another. So much of the literature focuses on agonistic behavior, yet agonistic behavior is far, far rarer in wild canids than submissive behavior is. In nuclear wolf families, aggression is almost nonexistent. The word ‘submissive’ has a negative connotation. It suggests a loss of power, a humbling, a subjugation. It might be better to remove it as a label for certain types of canid behavior, in that case. 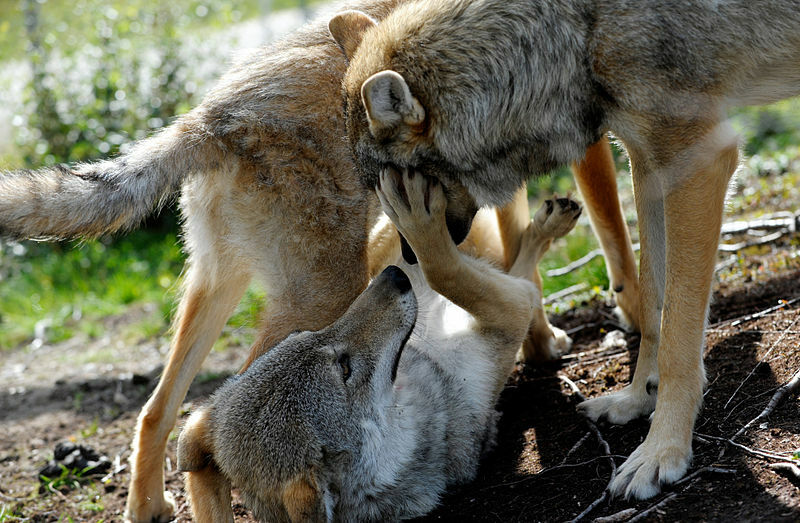 Canids don’t demand submissive behavior from one another, they offer it. 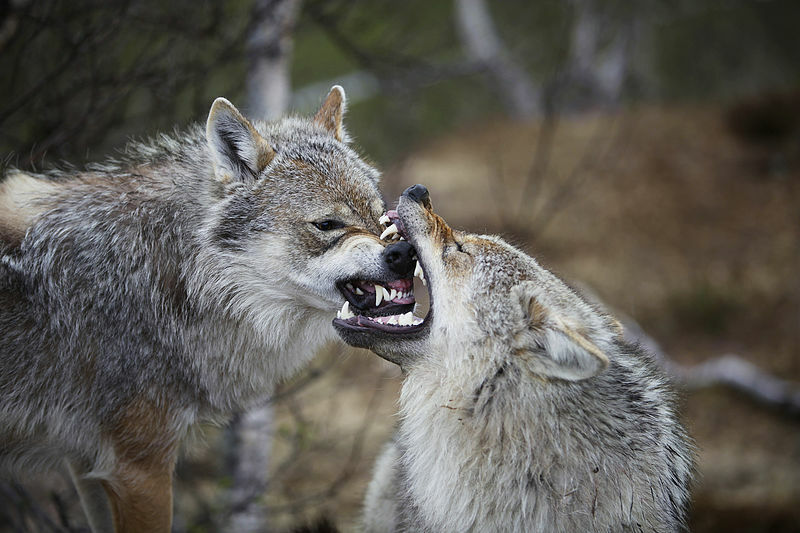 Muzzle-biting in wolves, which seems fierce, is usually solicited from the animal being bitten- several times in a row. Far from the popularized “alpha roll,” canids rarely force each other to roll over- they use rolling over as an invitation to play or a plea for affection. This type of affiliative, cohesive behavior makes up the vast majority of all social behavior in canid groups. A wag of the tail and an open, panting mouth is called submissive by the literature, but in that case, so is a human smile. Read on: I have written other articles on the evolution and diversity within Canidae as well as on an unusual canid called the raccoon dog. If you want to learn about a wolf that is not a wolf at all, you can read about the aardwolf; if you want to learn about why small dogs live longer than large dogs, well. You get the gist. I’m also writing a novel about some canines living in the big city! Bradshaw, J. W., Blackwell, E. J., & Casey, R. A. (2009). Dominance in domestic dogs—useful construct or bad habit? Journal of Veterinary Behavior: Clinical Applications and Research, 4(3), 135-144. Cordoni, G., & Palagi, E. (2008). Reconciliation in wolves (Canis lupus): new evidence for a comparative perspective. Ethology, 114(3), 298-308. Creel, S., & Creel, N. M. (2002). The African wild dog: behavior, ecology, and conservation. Princeton University Press. Derix, R., Van Hooff, J., De Vries, H., & Wensing, J. (1993). Male and female mating competition in wolves: female suppression vs. male intervention. Behaviour, 141-174.
de Villiers, M. S., Richardson, P. R., & van Jaarsveld, A. S. (2003). Patterns of coalition formation and spatial association in a social carnivore, the African wild dog (Lycaon pictus). Journal of Zoology, 260(04), 377-389. Fatjó, J., Feddersen-Petersen, D., Ruiz de la Torre, J. L., Amat, M., Mets, M., Braus, B., & Manteca, X. (2007). Ambivalent signals during agonistic interactions in a captive wolf pack. Applied Animal Behaviour Science, 105(4), 274-283. Girman, D. J., Mills, M. G. L., Geffen, E., & Wayne, R. K. (1997). A molecular genetic analysis of social structure, dispersal, and interpack relationships of the African wild dog (Lycaon pictus). Behavioral Ecology and Sociobiology,40(3), 187-198. Langbein, J., & Puppe, B. (2004). Analysing dominance relationships by sociometric methods—a plea for a more standardised and precise approach in farm animals. Applied animal behaviour science, 87(3), 293-315. Packard, J. M. (2003). Wolf behavior: reproductive, social, and intelligent. Wolves: behavior, ecology, and conservation. University of Chicago Press, Chicago, Illinois, USA, 35-65. Rütten, S., & Fleissner, G. (2004). On the function of the greeting ceremony in social canids- exemplified by African wild dogs Lycaon pictus. Canid News, 7. Schenkel, R. (1947). Expression studies of wolves. Behaviour, 1(8), 1-129. Sillero-Zubiri, C., Gottelli, D., & Macdonald, D. W. (1996). Male philopatry, extra-pack copulations and inbreeding avoidance in Ethiopian wolves (Canis simensis). Behavioral Ecology and Sociobiology, 38(5), 331-340. Sparkman, A. M., Adams, J. R., Steury, T. D., Waits, L. P., & Murray, D. L. (2012). 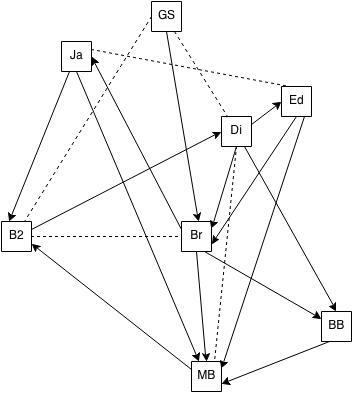 Pack social dynamics and inbreeding avoidance in the cooperatively breeding red wolf. Behavioral Ecology, 23(6), 1186-1194. Stahler, D. R., Smith, D. W., & Landis, R. (2002). The acceptance of a new breeding male into a wild wolf pack. Canadian journal of zoology, 80(2), 360-365. Tagged animal behavior, canidae, gray wolf, social behavior. First, dominance hierarchies are precisely NOT determined by who wins fights. It is determined by a ranking of supplanting behaviours. See Martin and Bateson’s “Measuring Behaviour” (first or second edition). This actually explains why some authors mis-identify top-ranking animals. Second. If you read carefully Mech 1999, he never rejects the concept of dominance in wolves. He does reject the idea of the need for a DH in arctic wolves on Ellesmere because they form nuclear family groups and the young don’t become part of a DH until they reach sexual maturity. Furthermore, in more recent papers, Mech speaks freely of dominance in wolves (including in his edited book “Wolves” with Boitani). So the concept of dominance or dominance hierarchy has not been rejected. It has been updated… and that started before Mech, by the way (see papers by the Fentress group from Dalhousie University, in fact, from captive wolves…). This idea that all captive wolves show more aggression and dominance is not actually supported by data. As I discussed at SPARCS last year, even stress levels of captives wolves may actually be lower than wild wolves, at least the ones living in comfy captive conditions. In summary, not all captive wolves are the same, not all free-ranging wolves are the same, sometimes dominance is very much present (see recent papers by Mech), and sometimes it is not (including in captive conditions). This is not a black and white issue like so many people (including some scientists) want to depict it. You do make some important points. For example, “In nuclear wolf families, aggression is almost nonexistent.” True from my observations, although ironically, if you read carefully the Mech (1999) paper, Mech makes the point that parents are very firm with the young. I discussed this with Jane Packard (that spent time with Mech in Ellesmere). Interestingly, after talking to her, I am not convinced that she actually agrees with Mech on this. In fact, when we (McLeod, Fentress, myself) discussed that paper in 2000, we panicked… We actually thought that the dog training world was going to jump on that sentence to justify firm if not coercive training methods with dogs. Simon Gadbois, Canid Behaviour Research Lab, Dalhousie University. Hi, first let me thank you for taking the time to leave a comment! In terms of dominance, I agree that Mechs never actually rejected it as a construct; I just wanted to emphasize that sometimes arguing that wolf A is dominant over wolf B can be extraneous information when you look at their familial relationships and see that wolf A is wolf B’s father. Mechs himself discusses this in his 1999 paper. I also have to admit that I tend to overemphasize this point because I talk to many people who have an understanding of dominance that is very aggression-based. Perhaps I wasn’t clear that I didn’t think that the application of dominance hierarchies had been rejected in wild wolves, but rather the strict linear alpha-beta-omega style (mostly the popsci understanding of it, too). You are right that in my examples I should not have used “fights” as a means of determining dominance, but rather “x behavior.” I used fights as a simpler way of conveying the information, but it is incorrect. And you are right that I overgeneralized the aggression/stress levels of captive and wild wolves. Thank you again, and I really appreciate your comments! Please, it’s Mech, not Mechs. Thank you for a wonderful post, the incoherency alone of the popular notion of a wolf pack hierarchy should have long since disqualified it from the popular consciousness, let alone its general ugliness and deleterious effect on how people relate to their domestic dogs. Pingback: Dominance…again? | Breathing Deeply . . .
hello so, this is all well and good and very interesting. I do know from interacting with pets about displays of ‘submission’ being used to garner affection (belly rubs!). But you mention how incorrect theories of dominance are used in pet training–I’m planning to get a dog soon and want to do extensive training. Could you point me towards resources or elaborate on how this understanding of canine-canine relationships changes best practices for training?